We did both. We cut down the weight of our payload anyway we could without comprimising the success of the mission. String weight was reduced, lighter cameras were used, we even minimised the amount of duct tape needed to seal the paylaod.<br><br>Another aspect we wanted to improve was steadying the payload. Although the wind anchor from the previous flight provided a bit more stability, some of our pictures showed the payload was still swinging and twisting quite fast.<br><br>To reduce the swinging and twisting, we employed the physics of simple harmonic motion and decided to use a much longer piece of string between the payload and the parachute. The total distance between the payload and the balloon was 16m! This included the length of the stretched parachute. Our preparation and launch procedures were similar to HAB3 - lots of function checks, lift calculatioins and testing. 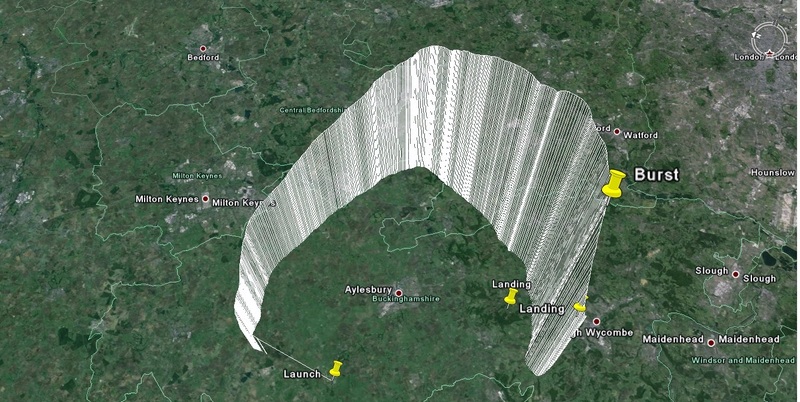 The predictor program indicated the landing would be near Princes Risborough - only 15 miles from the launch location. After carefully working through our launch procedure, our helpful 6th form student released the balloon. He picked a good week to do work experience with us! The SMS tracker stopped sending signals about 1km above the earth and we relied on the trusty Habduino radio tracker to send us live telemetry of the flight. The recovery team se off towards the predicted landing location and tracked the balloon's progress along the way. We were thrilled when th balloon was still going strong after 30km. The maximum altitude was 32195m - a new record for BALYOLO! We were very lucky with the wind and weather. The payload nearly circumnavigated aylesbury and landed in a field next to Hampden House, which is very beautiful. The SMS tracker kicked in at about 500m and sent updated coordinate every 30s. It was then simply a matter of skipping across the field to retrieve it. The only disappointment during this launch was the cameras. They switched themselves off after 20 minutes so we missed all the pictures at our record maximum altitude. 2) Improve radio tracking system so we don't have to rely on the SMS tracker.